There’s nothing like a good spring cleaning to lift the soul. A thorough spring cleaning says to the world, “So long, Winter! It’s time for Spring.” April and May are the prime months for spring cleaning. Before inviting someone into your office or home for spring cleaning, make sure you’re dealing with the best in the business. You want someone you can trust, someone who is a carpet and hard-surface flooring expert. How do you know you’re getting the best service available in the floor-cleaning industry? Look for a company that’s industry-certified. NEW Solid Surface Cleaning, Pulaski, recently renewed its Institute of Inspection, Cleaning and Restoration Certification. What does this mean to you? It means you’re working with a floor cleaning company that is an industry leader. Dozens of cleaning companies operate in the Green Bay area, but only 5 Green Bay cleaning companies are certified by the IICRC. The IICRC is the nation’s cleaning and restoration certifying body. When hiring a certified company, you welcome into your home or business a cleaner you can trust. Not every floor and carpet cleaning company is created equal. Inexperienced companies can damage your flooring, carpet, showers, counter tops, or upholstery. They may not carry property and liability insurance to right the situation if an accident occurs. That’s why you want to partner with a company like NEW Solid Surface Cleaning. We are fully insured and industry-certified. We took the time to invest in our education and gain the credits needed for certification. Moreover, we know the latest professional cleaning methods, and we use the most effective cleaning solutions. It’s no surprise that carpet manufacturers trust only certified companies to perform warranty work. A carpet manufacturer knows the certified company will do the job right. Are you ready to brighten your home or business with a bit of spring cleaning? Call Randy at 920-604-3773 to schedule your spring-cleaning appointment. This entry was posted in Cleaning Tips, Customer service, Floor Cleaning on April 1, 2019 by Joan Koehne. At NEW Solid Surface Cleaning, we have one simple goal: happy customers. Customer service is our priority, from the moment you schedule your floor cleaning appointment to the moment we pull out of your driveway after the job. Here’s the customer service you can expect from us. We’ll greet you at the door with a friendly smile and a hand shake. Then, we’ll ask to see the area you want cleaned: carpet, upholstery, tile and grout, wood, vinyl or natural stone floors. We’ll ask about any special circumstances. Are there any pet stain issues? Have you noticed any other spills or stains? Do we need to watch out for pets or small children while we’re cleaning? Does it matter where we start? What would be most convenient for you? Certainly, we realize we’re guests in your home, and we do our best to be courteous and considerate of your needs. Customers typically do a good job moving furniture out of the way for cleaning. If it’s difficult for you to move the furniture yourself, we’ll move it at no extra charge. We can easily place sliders under sofas, loveseats and recliners to move them. Entertainment centers, curio cabinets, beds, dressers and other large furnishings are best left in place. We can clean around them. First and foremost, we make sure your property and furnishings are protected while we’re cleaning. The cleaning method we use to clean floors is safe and effective. Every step of the cleaning process is carefully completed by our professionally trained staff. Detail oriented, we use corner guards to prevent our hoses from bumping or rubbing against corners as we clean. We lay towels in transition areas to prevent slips. We make sure to vacuum, pretreat, scrub and rinse all accessible areas of the floor or upholstery. Most customers are concerned about how long it takes for their carpets to dry. Because of this, we always place fans in the carpeted rooms that we’ve cleaned. We are very conscious of having the carpets dry in 4 to 5 hours. That way, you can get back to your normal routine. Any furniture we removed will be put back in place. We’ll pack up our hoses and cleaning tools and be on our way. We can lock up when we leave, if you prefer. It’s all about providing the best possible customer service we can. Our customers know we’ll take care of any floor or upholstery cleaning they need. To schedule a residential or commercial floor cleaning appointment, call Randy at 920-604-3773. This entry was posted in Cleaning Tips, Customer service, Floor Cleaning on January 21, 2019 by Joan Koehne. ‘Tis the season to eat, drink, and be merry! The holidays are a prime time for holiday parties and family get-togethers. When you combine a lot of people with a lot of food, a lot of spills and stains can happen. NEW Solid Surface Cleaning can be your after-party ally. An ugly stain can ruin a perfectly beautiful carpet, tile, or stone floor. We’ve seen some doozies! You could spend a small fortune to replace the flooring, or you could call us to remove the stain. Our stain removal techniques extend the life of your carpet or flooring and save you money in the long run. Here are the Dos and Don’ts for cleaning up food and drink spills. Use over-the-counter cleaners, soap or detergents. These stain removers typically aren’t strong enough to remove the stain, and they might set the stain or cause permanent discoloring. Blot or dab the spill using a white rag or paper towel. Avoid using a colored rag, because its color may transfer to the surface you’re trying to clean. Use the 8-ounce bottle of spot remover we left behind after cleaning your carpet, tile, or vinyl floors. The spot remover is safe for any cleanable surface. Call us and tell us what happened. We’ll work with you to determine the best option for stain treatment and removal. At NEW Solid Surface Cleaning, we know what cleaning solutions to use to remove the stain without discoloring the flooring. Depending on the type of spill, we use an oxidizer or a reducer, whichever is right for the job. Oftentimes, a stain requires a very thorough flushing. We have the water and equipment necessary to flush the carpet, vinyl, and tile floors. We also have techniques to dry floors quickly and safely. You’ll be able to walk on the floor again in no time. So, enjoy the food, family, and fun of the holiday season. Don’t worry about spills and stains, because NEW Solid Surface Cleaning is your after-party ally. This entry was posted in Cleaning Tips on November 26, 2018 by Joan Koehne. Wouldn’t you love to wave a magic wand to clean your tile floors? We may not be magicians, but we have the professional tools that will leave your tile floors bright and shiny. Tile and grout cleaning is one of the professional services we offer customers in Northeast Wisconsin. We’ll leave your floors sparkling. Before we walk out your door, we’ll give you some cleaning tips so you can maintain that sparkle on your own. Avoid multi-surface cleaners like Top Job, Pine-Sol or Mr. Clean because they can leave a soapy residue in the grout line that’s a magnet for dirt. If you do use these detergents, be sure to rinse the floor thoroughly after cleaning. Keeping the grout lines clean and stain free can be tricky. Grout is concrete, and it’s very porous. It absorbs dirt, mold, mildew, and bacteria and can erode over time. To keep the grout line clean and to prolong its life, we recommend sealing it. Sealing protects the grout line for 5-6 years. Flooring installers typically don’t return after the grout has cured to seal it, so it’s one of the professional cleaning services we offer. 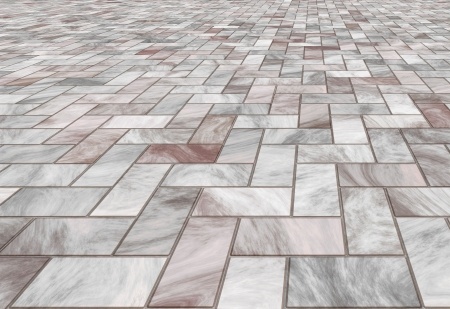 How often you clean your tile or stone floor depends on your lifestyle. Homes with kids and pets or businesses with high traffic areas require more frequent cleaning. We recommend contacting us to schedule floor cleaning every year or every other year. When the floor loses its shine, it’s time to give us a call to schedule a professional cleaning. We’ll perform the magic that leave your floors sparkling. Call Randy at 920-604-3773 to schedule your appointment. This entry was posted in Cleaning Tips on July 2, 2018 by Joan Koehne.